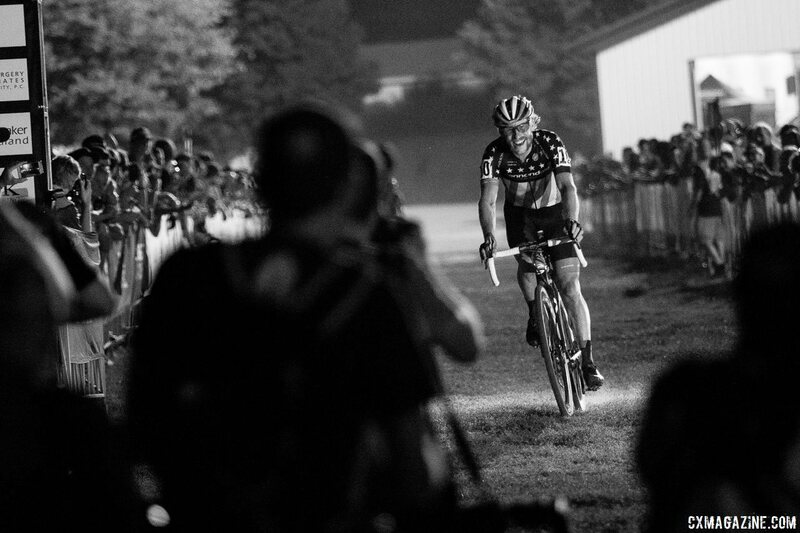 Jingle Cross has evolved over the last two years. A typically snowy December event turned to a hot, humid and muddy World Cup in 2016, and this year, high temperatures and no rain turned conditions dry and dusty. Lap times on the warm Midwestern evening were fast, with riders consistently turning in laps under six minutes. One of the big questions heading into Friday night’s C1 event was which riders would take to the start line to chase after the big C1 points and get a warm-up in ahead of Sunday’s World Cup. 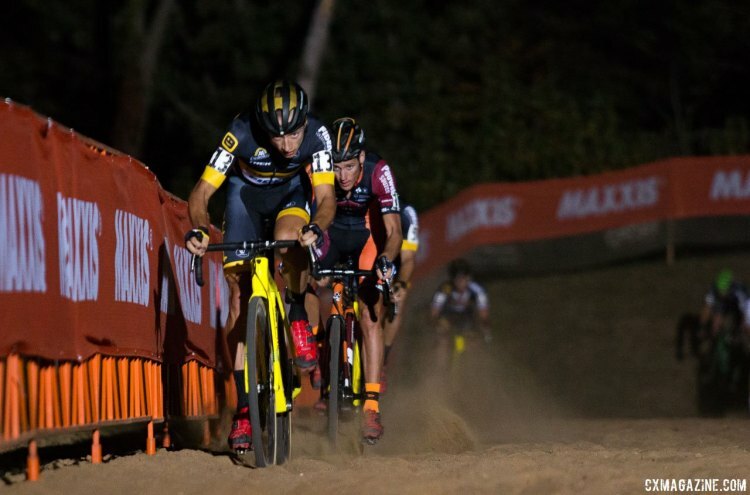 Defending world champion Wout van Aert (Crelan-Charles) and his rival Mathieu van der Poel (Beobank-Corendon) did not race Friday night, but a number of riders did. 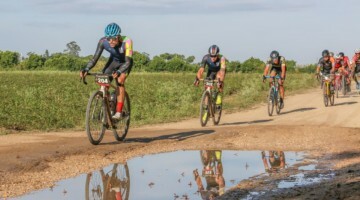 A lead selection of Laurens Sweeck (ERA-Circus), Quinten Hermans (Telenet Fidea Lions) and Michael Boros (Pauwels Sauzen Vastgoedservice) broke free from the rest of the field early in the race when the other riders could not match their blistering pace. Each of the riders in the break has their strengths, the question was which skillset would reign supreme on the slopes of Mt. Krumpit? 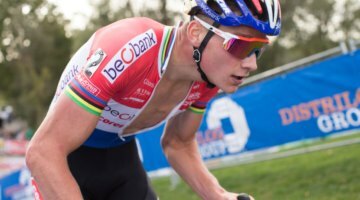 Would it be Hermans’ climbing or Sweeck’s power? The early stages of the C1 event started with the Europeans establishing a long line at the front of the race. When the riders hit the Mt. Krumpit climb for the second time, a lead group of eight riders established itself at the front, with American Stephen Hyde (Cannondale p/b/ Cyclocrossworld.com) chasing behind them in ninth. The early animator from the large group was young Quinten Hermans. He opened up a small five-second gap back to Boros, Corne van Kessel (Telenet Fidea Lions) and a host of other riders two laps into the ten-lap race. Hermans maintained a small gap for another lap and a half before Laurens Sweeck and Michael Boros made the catch and established the lead selection. Corne van Kessel was riding a strong fourth early on, but he would eventually fade through the middle part of the race and ended up battling with Stephen Hyde for seventh during the last third of the one-hour race. Sweeck’s big move happened at nearly the midpoint of the race. Sweeck, Hermans and Boros were all riding together when the trio descended the Bobsled Bomb off of Mt. Krumpit and charged through the sand pit during the fifth lap. 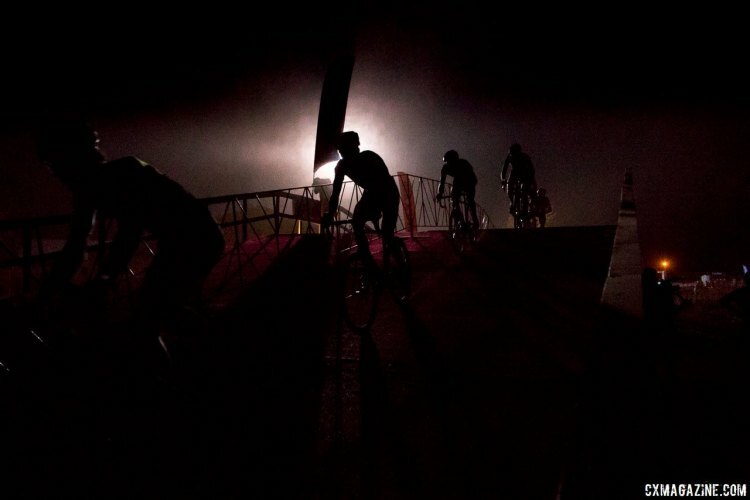 The back half of Friday night’s Jingle Cross course weaved through a series of barns and then headed up and around a set of bleachers. It was in this section Sweeck made his move. He got a small gap on Hermans and then was able to power away through the long, flat start/finish straight. When the dust settled, he opened up a six-second gap back to his chasers. 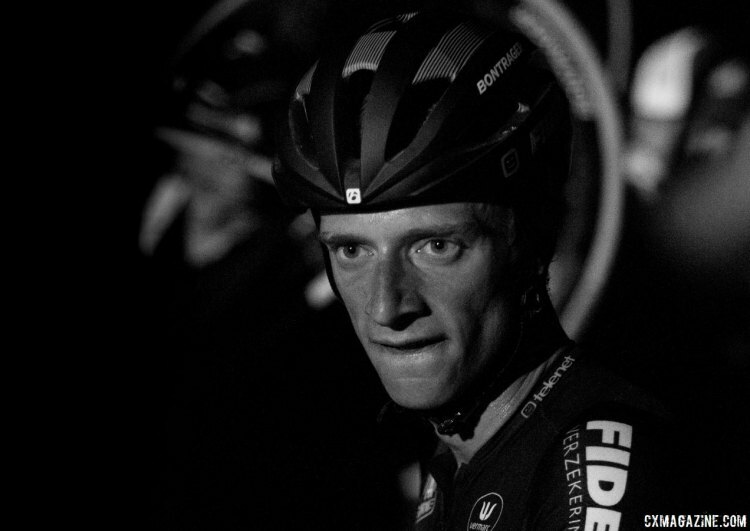 Hermans soon followed suit and opened up a gap to take over a solo second position on Mt. Krumpit. For the rest of the race, Sweeck held Hermans at bay and kept the gap between the two at 10 to 15 seconds. Hermans at times appeared to close it a bit on the Mt. 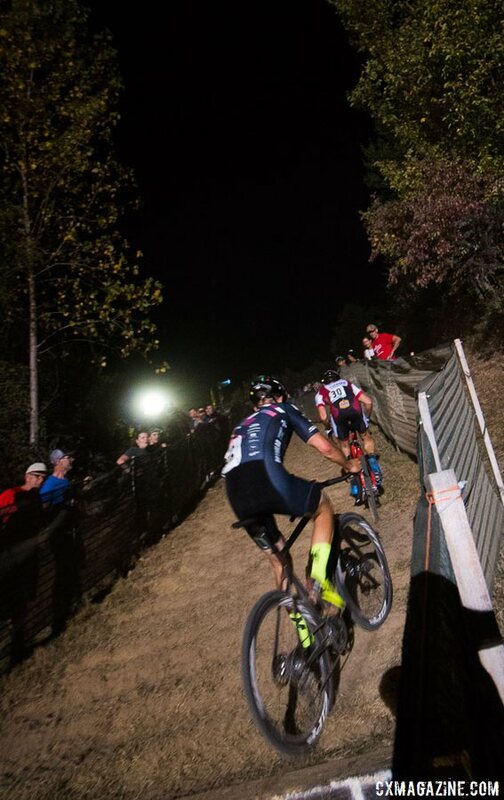 Krumpit climb, but Sweeck was able to take advantage of the power sections to open the gap back up over Hermans. Sweeck was not challenged the rest of the race and won Friday night’s Jingle Cross C1 ahead of Sunday’s World Cup. After Hermans broke out into a solo second, Lars van der Haar made the catch on Michael Boros and Jens Adams early in the sixth lap. Once with the other two, Van der Haar blocked the chasers’ effort and sealed Hermans’ grasp on second place. 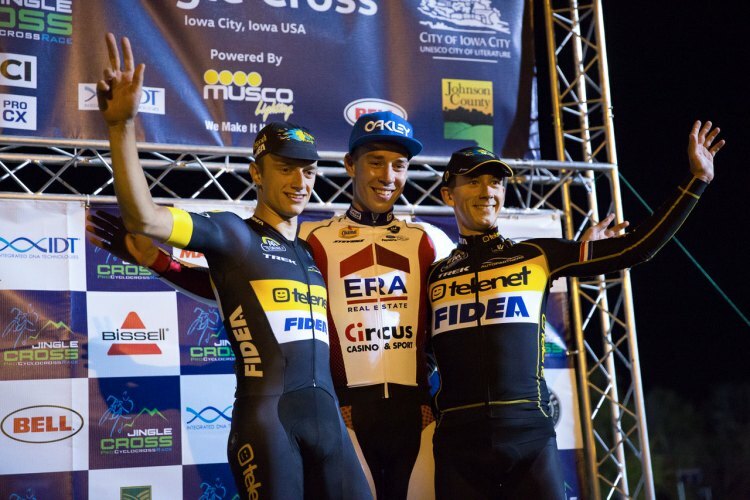 The rare cyclocross teamwork was successful, and Hermans hold on second swelled to over 30 seconds by the end of the evening’s affairs. With Hermans gone to a second-place finish, the battle still to be decided was the one for third place. The trio battling for third stayed together for over two laps before Van der Haar roared up Mt. Krumpit with two laps to go to establish a solid solo third position. He would not be challenged for the rest of the race en route to finishing third. Jens Adams finished fourth and Michael Boros took fifth. The eyes of many at the Johnson County Fairgrounds were on defending national champion Stephen Hyde. 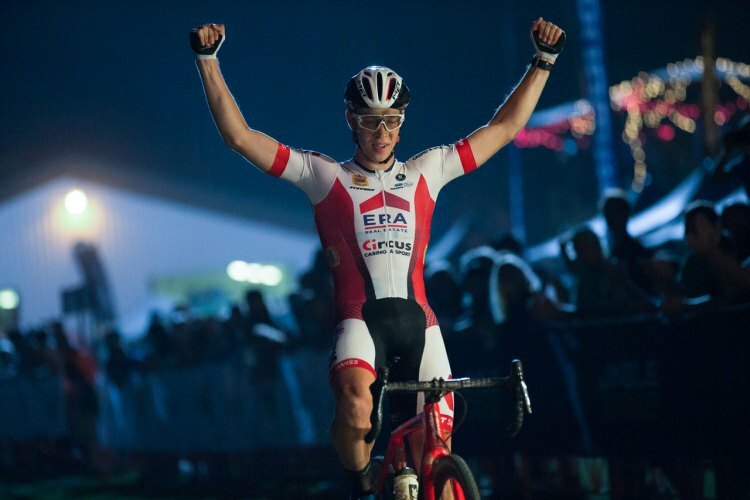 Hyde defeated Belgian Rob Peeters last weekend at Rochester, so U.S. fans were excited to see how he could do against a larger European contingent. 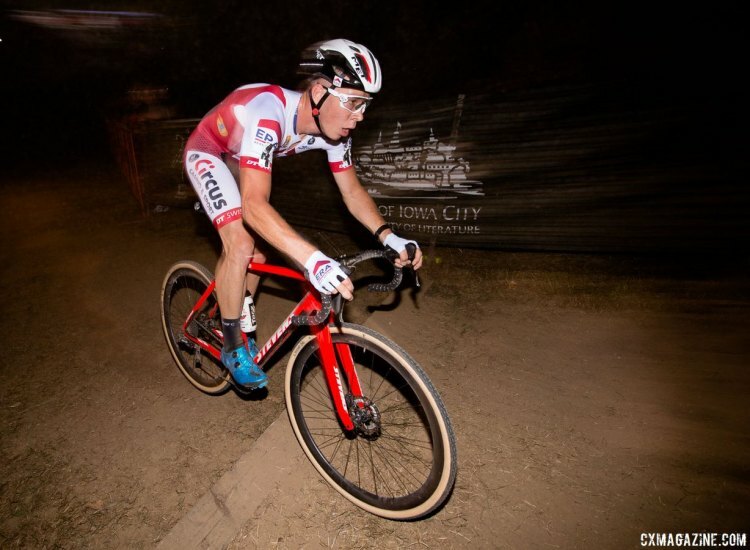 Hyde put himself in the top ten early on and kept his pace high as the Belgians at the front set a blistering pace on the warm Midwestern evening. 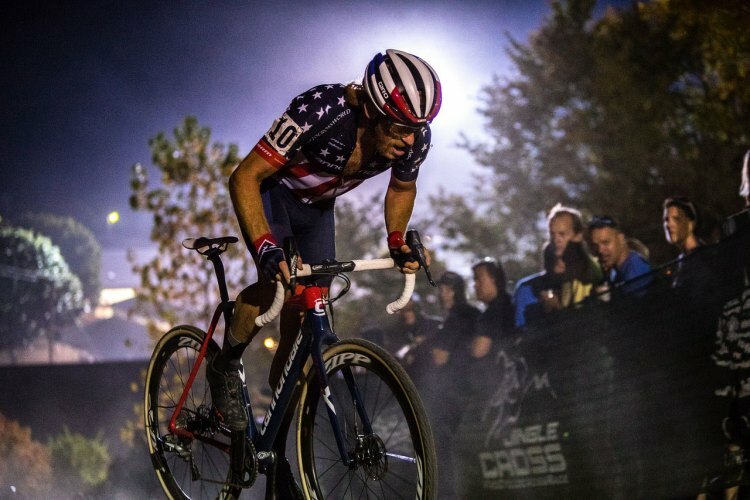 Hyde was ninth early on, and when the figurative and literal dust settled after the fast start, Hyde was in a two-up battle for eighth with Dutch rider Stan Godrie. Hyde eventually shook Godrie and then locked horns with the fading Corne van Kessel for the last third of the race. Van Kessel seemed to get a second wind when he met up with Hyde, and the two traded wheels for much of the rest of the race. Van Kessel eventually broke away on the last lap to take seventh and Hyde finished eighth. American Tobin Ortenblad rode with Hyde early on and stayed near the top ten for the entire race. He barely missed out on top ten honors when Diether Sweeck edged him out in the race’s closing kick. 15 43 HECHT Gage 1:04:12 s.t. 24 50 KAISER Cody 1:05:53 s.t.